Rosamund Pike: Former Bond Girl Makes With The Funny. | The Cineaste's Lament. ← “Green Lantern” Blu-Ray DVD Highlights Special Effects. 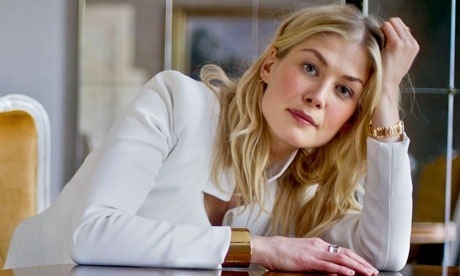 Rosamund Pike: Former Bond Girl Makes With The Funny. Pike’s appearance opposite Pierce Brosnan’s suave super-spy turned her into a very English sort of pin-up, a very crisp beauty suggesting sunny spring days with just a hint of snap in the air. There is no small irony, of course, that the Atkinson comedy features Mr. Bean his ownself as a spectacularly inept secret agent. But no matter. “Johnny English, Reborn,” starring Rowan Atkinson, Gillian Anderson and Rosamund Pike opens in the U.S. on Oct. 21. This entry was posted in comedy, Film News, James Bond, Screen Sirens, Thinking About Movies and tagged Die Another Day, James Bond, Johnny English Reborn, Pierce Brosnan, Rosamund Pike, Rowan Atkinson. Bookmark the permalink.